Materialism is a system of thought that holds matter to be an absolute entity and denies the existence of anything but matter. 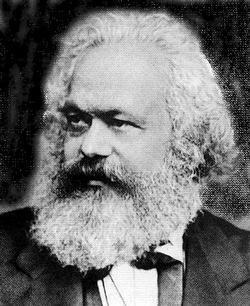 Having its roots in ancient Greece and gaining increased acceptance, particularly in the 19th century, and becoming famous with the dialectical materialism of Karl Marx, this system of thought claims that matter has existed forever and that it will exist for all eternity. Since it maintains that matter is not created, it does not accept the existence of a Creator. As we have just stated, materialism became popular mainly in the 19th century. One of the principal reasons for this is the "static universe" model that was then produced in response to the question of "how the universe had come about". This model answered the question by stating that the universe had not come about, it had existed forever and would continue to exist forever. The universe was accepted to be a stable, constant and unchanging collection of matter and the notion was promoted that such a universe did not require us to believe in a Creator. In saying, "this is something to which science cannot concede," Georges Politzer is actually referring to the materialist world view, not to science. As a matter of fact, one of materialists' most-known false beliefs is the error that science has to be materialist. In writing these lines, Politzer imagined that science was on his side and that subsequent progress would confirm the idea of the boundless universe. At the end of a period that started in the second quarter of the 20th century, modern science, however, proved the fact admitted by materialists when they said: "If it was so, then we would perforce agree that a Creator existed,"-that is, that the universe had a beginning. This fact was revealed after a number of stages. 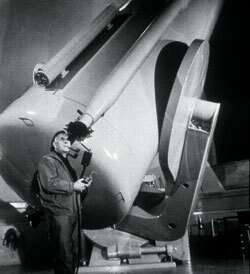 Edwin Hubble, next to his giant telescope. The 1920s were important years in the development of modern astronomy. In 1922, the Russian physicist Alexandra Friedman produced computations showing that the structure of the universe was not static and that even a tiny impulse might be sufficient to cause the whole structure to expand or contract according to Einstein's Theory of Relativity. George Lemaitre was the first to recognize what Friedman's findings meant. Based on these computations, the Belgian astronomer Lemaitre declared that the universe had a beginning and that it was expanding as a result of something that had triggered it. He also claimed that radiation surviving from that initial moment would also be detected. In fact, working on a different research, Vesto Melvin Slipher, had already determined, in 1913, before Lemaitre, that some galaxies near us were rapidly moving away from the Earth. This discovery by Slipher was the first clue to show that the universe was expanding. The theoretical musings of these scientists did not attract much attention and probably would have been ignored except for new observational evidence that rocked the scientific world in 1929. That year the American astronomer Edwin Hubble, working at the California Mount Wilson observatory, made one of the most important discoveries in the history of astronomy. What Hubble initially wanted to do was to study far-off galaxies and to try to establish the movements of the stars and their chemical structures based on the information regarding the light they emitted. Hubble and his team analyzed the light rays arriving from distant galaxies one by one and made significant discoveries. One of these was that the commonest elements in the galaxies were hydrogen and helium. This discovery confirmed information put forward by previous scientists, and was accepted without controversy by the scientific world. Hubble's other discovery stunned the scientific world, however: He noted that light emitted from stars shifted toward red. The universe came into being with the explosion of a single point of zero volume. And that shows that the universe had a beginning. That being the case, Hubble and his team's discovery indicated that all the galaxies were moving away from us and the stars and galaxies were not just moving away from us, but also from each other. The greater the distance, the greater the speed. Hubble designed a mathematical equation to express this, known as "Hubble's law." This law was once again conformed by every new piece of information from distant galaxies. But no matter how much materialists sought to play down Hubble's discoveries, new findings and data obtained shortly after once again confirmed the irrefutable fact that the universe is expanding. Hubble's discovery that the universe was expanding led to the emergence of another model that needed no fiddling around with to make the equations work right. If the universe was getting bigger as time advanced, going back in time meant that it was getting smaller; and if one went back far enough, everything would shrink and converge at a single point. Scientists unable to refute this state of affairs theoretically imagined they could do so with mathematical data. The Oxford University mathematician Roger Penrose worked on various hypotheses using Einstein's mathematics. Penrose's research inflicted a terrible disappointment on materialists, because mathematical formulas showed that gravitational attraction would cause a large amount of matter to collapse, becoming an increasingly denser and smaller "single point." 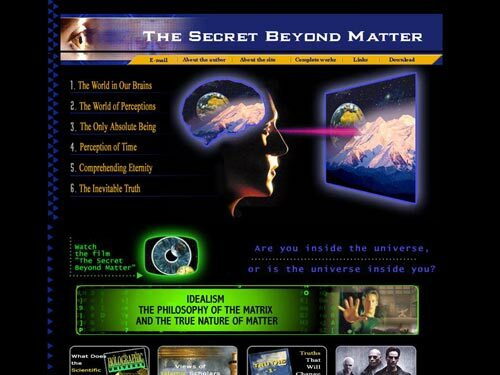 … outside the singularity there is no where. When the universe begins to expand, it won't be spreading out to fill a larger emptiness. The only space that exists is the space it creates as it goes. It is natural but wrong to visualize the singularity as a kind of pregnant dot hanging in a dark, boundless void. But there is no space, no darkness. The singularity has no "around" around it. There is no space for it to occupy, no place for it to be. We can't even ask how long it has been there-whether it has just lately popped into being, like a good idea, or whether it has been there forever, quietly awaiting the right moment. Time doesn't exist. There is no past for it to emerge from. The conclusion to be derived from the calculations was that at some time, all the matter in the universe was compacted in a single point-mass that had "zero volume" because of its immense gravitational force. In an announcement issued in 1970, Penrose and Hawking revealed that the universe had come into being through the explosion of this "point" with zero volume. The formulas they discovered left no room for any alternative proposition. In this way, the theory known as the "Big Bang" had been proved mathematically. An observer who views the spectra of a distancing object will see that this become increasingly redder. 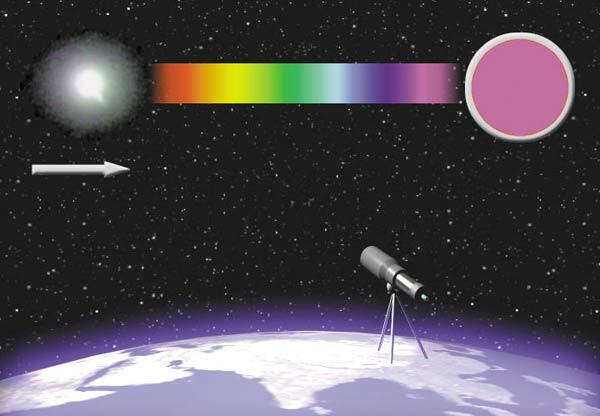 Observations made from the earth have shown that the spectra of light beams of the galaxies and stars in the sky increasingly tend towards red. This means that heavenly bodies constantly move away from us. The discovery of this fact by observations made in the 1920's has proved that the universe has an expanding structure and that it originated in the Big Bang. Why Were Materialist Scientists Unable to Accept the Big Bang? A photograph taken by the Hubble telescope. Every luminous point in the picture is a galaxy. 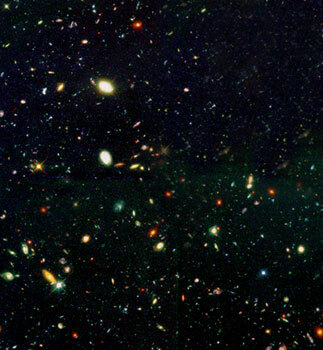 It is estimated that there are approximately 300 billion galaxies in the entire universe. It is predicted that there are on average 250-300 billion stars in each galaxy. All of the matter and energy making up this giant universe is created from nothing and this is very clear evidence for creation. The Big Bang theory quickly gained wide acceptance in the scientific world due to the clear-cut evidence for it. Nevertheless scientists who favored materialism and adhered to the idea of an infinite universe that materialism seemingly demanded held out against the Big Bang in their struggle to uphold a fundamental tenet of their ideology. The reason was made clear by the English astronomer Arthur Eddington, who said "Philosophically, the notion of an abrupt beginning to the present order of Nature is repugnant to me".6 In other words, materialist scientists continued to espouse an error, not out of scientific concerns, but from ideological ones. Consider the enormity of the problem [for the scientists]. Science has proven that the Universe exploded into being at a certain moment. … Who or [W]hat put the matter and energy into the Universe? Was the Universe created out of nothing …? Materialist scientists preferred the difficult alternative and persisted in the denial of Creation. One of the theories proposed against the Big Bang was the "steady state theory," which was espoused most determinedly for a time, despite all the scientific realities. 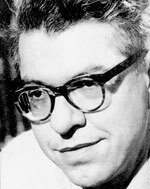 Another astronomer who opposed the Big Bang theory was Fred Hoyle. Around the middle of the 20th century he came up with a model, which he called "steady-state", that was an extension of the 19th century's idea of an infinite universe. According to Hoyle's model, as the universe expanded new matter was continuously coming into existence by itself in just the right amount to keep the universe in a "steady state". In fact, the theory launched by Hoyle and his team contained a number of internal inconsistencies. More importantly, these constituted the basis of new developments that would soon demolish the theory. Hoyle wanted to account for the emergence of certain chemicals that gave rise to all the matter in the universe. He maintained that stars had moments of birth and death and that they produced all chemical elements throughout their lives. According to this view, the stars came into being when hydrogen atoms in space were pulled together under the force of gravity into increasingly larger spheres. As these spheres grew, so the inward pressure of gravity increased, with the pressure eventually reaching such a point that some of the hydrogen atoms fused together, thus producing helium atoms.13 This conversion happens on a constant basis, and stars are exposed to processes of fusion that give rise to the next heaviest chemical element. These progressive reactions continue with the production of numerous light elements as far as iron, and eventually a hot iron core remains. This stage is one in which the star continues to emit light, known as the white dwarf stage. When the star turns into a cold mass of iron that does not emit light, it moves to become what is known as the brown dwarf. If this final remnant of a star is not pulled into collision by the gravitational force of other bodies in the universe, then it remains in space. In large stars, as their lives come to an end, high temperatures and pressure sufficient to give rise to heavier elements arise in direct proportion to the gravitational force. During this process, elements are thrown off reaching far and wide as a very hot shining dust cloud is blown out into space. When these claims by Hoyle and his team were backed up by observations, scientific circles imagined for a moment that they supported the idea of the infinite universe. The fact is, however, that there was an important question that could not be answered by Hoyle's concept, which said that all the elements came in a cycle from hydrogen. The question concerned how hydrogen, the basis of all the elements and that gave rise to stars, first appeared. That is because an extraordinarily high-temperature explosion would be needed to produce hydrogen. The scientific answer to that question, which Hoyle ignored, once again came as a disappointment to materialists. 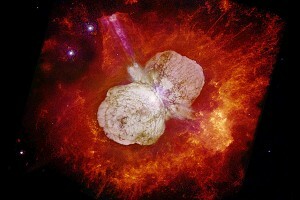 Eta Carinae star is destroyed by a supernova explosion. This and similar explosions always cause disorder. However, the Big Bang, known as the most drastic explosion ever to have taken place, has given way to a space based on extremely precise balances and all the systems therein. This extraordinary balance and order can by no means be explained away by coincidences and it all proves yet again that the entire universe has been created by an exalted and mighty Creator Who is Allah. In a radio program in 1940s, Hoyle said, "If the universe began with a hot Big Bang, then such an explosion would have left a relic. Find me a fossil of this Big Bang. 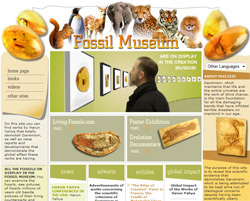 "14 The fossil that Hoyle and materialists never imagined would ever be discovered was in fact found soon after. In 1948, the physicist George Gamow launched a new theory in order to find the traces of the Big Bang. The formation of the hydrogen necessary for the first stars to emerge could be explained by the Big Bang setting up extraordinarily high temperatures. In fact, findings from the traces of the earliest galaxies showed that a cosmic makeup of 80% hydrogen and 20% helium formed at the moment of the great explosion. That being the case, the radiation caused by the high temperatures that gave rise to those elements should still be in existence, despite the passage of billions of years. Since the universe was expanding in all directions, like a balloon being inflated, low-level background radiation should have radiated out in all directions, and that now needed to be detected. Those traces were soon after identified, and the fossil that Hoyle was so certain would never be found was in fact discovered. In 1965, two researchers by the name of Arno Penzias and Robert Wilson discovered these waves, though they were not actually looking for them. This radiation, called "cosmic background radiation", was different from radiation coming from a particular point in space. It was extraordinarily uniform. In other words, it did not seem to radiate from a particular source but rather pervaded the whole of space. Thus, it was revealed that the heat waves that were uniformly radiated from all around space had been left over from the initial stages of the Big Bang. Penzias and Wilson were awarded a Nobel prize for their discovery. 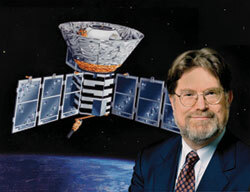 In 1989, George Smoot and NASA team sent a satellite into space. 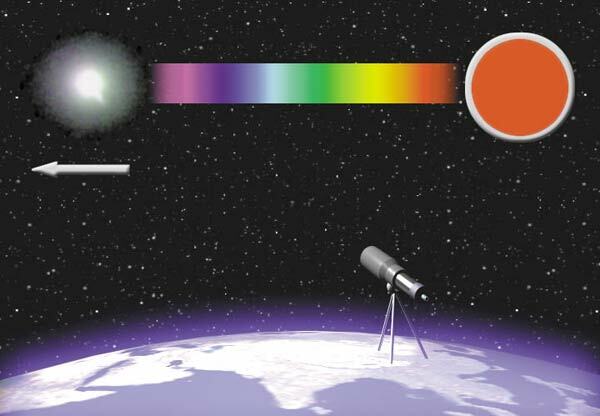 Called the "Cosmic Background Emission Explorer" (COBE), it took only eight minutes for the sensitive instruments on board the satellite to detect and confirm the levels of radiation reported by Penzias and Wilson. These results conclusively demonstrated the existence of the hot, dense form remaining from the explosion out of which the universe came into being.Cosmic background radiation was invisible to the naked eye, but it was everywhere in the universe and present everywhere we could see. If we could have seen these waves, the whole of the sky, in all directions, would have been equally brightly illuminated by it. One piece of information discovered in 1992 by George Smoot from data obtained from COBE once again proved the truth of the Big Bang and the false nature of the "steady state theory." Following discoveries by Penzias and Wilson, the adherents of the steady state theory came up with a new claim. They said that cosmic background radiation temperature was uniform and that there would have to be variations, in other words, small differences in temperature, in order for galaxies to form in the wake of a giant explosion. They suggested that so long as this temperature difference could not be identified, cosmic background radiation could not be used as evidence for the Big Bang. It was this temperature difference that the exponents of the steady state theory said was lacking that George Smoot determined in 1992. There were very small differences between the data sent by COBE in 1992 and the old map of the universe. The details in the picture were closely examined. The computerized maps revealed very small temperature differences in background radiation. For example, some regions had a temperature of 2.7251 Kelvin and others of 2.7249 Kelvin. The Big Bang had once again been confirmed by scientific findings and observations. About the 1992 observations, which were from the COBE (the NASA satellite Cosmic Background Explorer), there was a story on the front page of virtually every newspaper in the world. The thing that the London Times, New York Times, etc. seemed to pick up on was a statement by George Smoot, the team leader from the Lawrence-Berkeley Laboratory. He said, "It's like looking at [the signs of creation by] God." Obviously, this captured the public's attention. More evidence for the Big Bang was forthcoming. 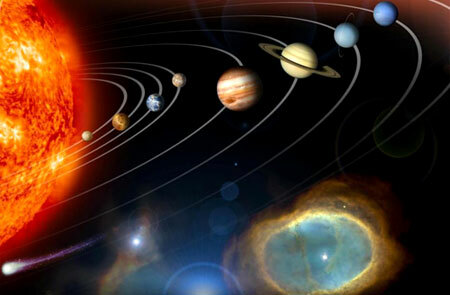 One piece had to do with the relative amounts of hydrogen and helium in the universe. Observations indicated that the mix of these two elements in the universe was in accord with theoretical calculations of what should have been remained after the Big Bang. That drove another stake into the heart of the steady state theory because if the universe had existed for eternity and never had a beginning, all of its hydrogen should have been burned into helium. Data obtained from George Smoot's COBE satellite enabled the Big Bang Theory to be irrefutably confirmed. Confronted by such evidence, the Big Bang gained the near-complete approval of the scientific world. In an article in its October 1994 issue, Scientific American noted that the Big Bang model was the only one that could account for the constant expansion of the universe and for other observational results. All of this compelling evidence caused the Big Bang theory to be embraced by the scientific community. The Big Bang model is the latest position reached by science on the formation and beginning of the universe. Many scientists who do not blindly condition themselves to be atheists have admitted the existence of Almighty Allah in the creation of the universe. This image prepared from data from the WMAP satellite in 2006 represents the expansion of the universe from the first moment of the Big Bang to the present day. The WMAP (Wilkinson Microwave Anisotropy Probe) satellite launched into space in 2001 and that enabled the clearest results to be obtained in 2003 also verified the accuracy of the Big Bang theory and enabled discoveries of the greatest significance to be made. Science magazine chose the studies on the basis of the data obtained from the WMAP as the breakthrough of the year 2003.21 The great majority of scientists agreed that the data sent back by WMAP represented a turning point in cosmology. 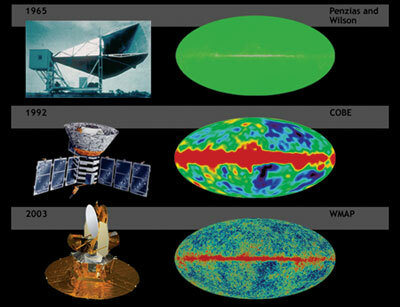 The WMAP mission addresses fundamental questions in cosmology: What is the geometry of the Universe? How did structures, such as galaxies and galaxy clusters, that we see in today's sky come about? How old is the Universe, and what are its constituents? Because of the lower sensitivity of the equipment on COBE, only the main lines of the cosmic background radiation in the universe had been mapped. The WMAP, however, was designed and launched specifically to measure the cosmic background radiation left over from the Big Bang. Cosmic background radiation, one of the greatest proofs of the Big Bang, was discovered in 1965 and has also been studied by the COBE (1992) and WMAP (2003) space satellites. The advanced equipment on the WMAP produced a more detailed map of the cosmic background radiation and permitted definitive results to be obtained in many spheres regarding the universe. These data also clarified many subjects of debate such as the universe's expansion rate, its composition and its density. 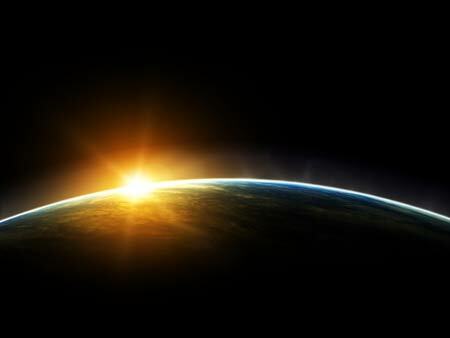 The first stars began shining about 400 million years after the Big Bang.24 Such an early dating astonished scientists. Two separate study groups made up of British, Australian and American scientists produced a three-dimensional map of some 266,000 galaxies in the wake of many years of research. The scientists compared the data they collected about the distribution of the galaxies with those of the cosmic background radiation disseminated throughout the universe, and obtained important findings about the origin of the galaxies. Researchers analyzing the studies concluded that galaxies formed where matter relatively clustered some 350,000 years after the Big Bang and took shape due to the gravitational force. The findings in question provided new evidence for the Big Bang theory. One study carried out over 10 years by the Anglo-Australian Observatory in New South Wales, Australia determined the positions in space of around 220,000 galaxies using a three-dimensional mapping technique. 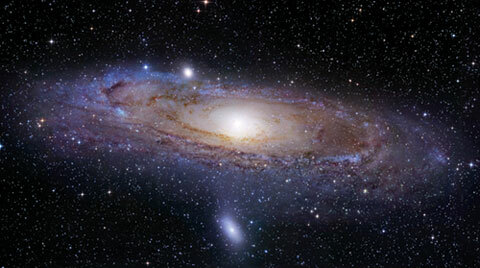 The mapping procedure, carried out using the observatory's 3.9 meter-diameter telescope, was nearly ten times larger than previous similar surveys.27 A team of scientists led by the director of the observatory, Dr. Matthew Colless, determined galaxies' positions relative to one another and the distances between them. They then modeled the distribution patterns and examined minute fluctuations in these models in great detail. Both groups' findings were announced at a meeting held by the American Astronomical Society in San Diego on 11 January, 2005. Colless and Eisenstein's teams determined a correlation between fluctuations in the distances between galaxies and the fluctuations observed in background cosmic radiation. It was thus established that the galaxies were seeded around 350,000 years after the Big Bang in areas where matter was slightly more intensely clustered together. We are so peaceful on the Earth where we live that we never realize we exist on a tiny planet moving at thousands of kilometers an hour in a boundless, airless cavity. The fact to be kept in mind, however, is that Earth is a special shelter created for man so that he may live thereon. To sum up, the definite conclusion reached by astrophysics was that the entire universe, with its matter and time dimensions, came into being at a moment of zero with a big explosion (Big Bang). Before the Big Bang, there was no such thing as time. Matter, energy, and time came into existence out of a state of nothingness where neither matter, nor energy, and nor time was existent this event can be defined as entirely metaphysical. However, this great reality discovered by modern physics only at the end of the 20th century was announced to us in the Qur'an 14 centuries ago. In reality, the Big Bang caused much greater trouble for the materialists and atheists, than the above confessions of the atheist philosopher, Antony Flew. The Big Bang proved not only that the universe was created out of nothing, but also that it was brought into being in a very planned, systematic and controlled manner. Perfect order arose after the Big Bang, which was an explosion. Explosions, however, never bring about order. All of the observable explosions tend to harm, cause to disintegrate, and destroy what is present. For example, the atom and hydrogen bomb explosions, fire-damp explosions, volcanic explosions, natural gas explosions, solar explosions all have destructive effects. If, however, we are introduced to a very detailed order after an explosion, we then conclude that there is an intellect, an intervention behind this explosion and that all the pieces dispersed by the explosion are made to move in a very controlled way. While stating that the Big Bang's giving way to order is contradictory, he surely interprets the Big Bang with a materialistic bias and assumes that this was an "uncontrolled explosion." In reality, however, he was the one who contradicted himself by making such a statement simply to dismiss the existence of a Creator, Who is Allah. If great order has arisen as the result of an explosion, then the concept of an "uncontrolled explosion" must be set aside and it must be accepted that the explosion was extraordinarily controlled. This order holds true for all stages after the Big Bang. The matter that has emerged with the Big Bang is in the form of the particles we call "atomic particles". But these have come together in an orderly manner and formed atoms everywhere and in every part of the universe. Being composed in great order, these atoms have formed galaxies by concentrating in certain parts of the universe. In these galaxies stars have formed stars, and around these stars, star systems and planets have come into existence. All these vast heavenly bodies are extraordinarily organized. If we think that there are approximately 300 billion galaxies in the universe, and 300 billion stars in each one of them, we can better understand the degree of the extraordinariness of the order and balance in question. Another aspect of this amazing order formed in the universe following the Big Bang is the creation of a "habitable universe". The conditions for the formation of a habitable planet are so many and so complex that it is almost impossible to think that this formation is coincidental. We must conclude, when we examine the glorious system in the universe, that the existence of the universe and its workings rest on extremely delicate balances and an order too complex to be explained away by coincidental causes. As is evident, it is by no means possible for this delicate balance and order to have been formed on its own and by coincidence after a great explosion. The formation of such an order following an explosion such as the Big Bang could only have been possible as a result of conscious interventions at each step. This is the creation of Allah, Who created the universe out of nothing and Who at every moment keeps it under His control and guidance. 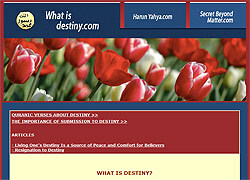 [Allah is] the Originator of the heavens and Earth. When He decides on something. He just says to it, ‘Be!’ and it is. As we have seen this far, the Big Bang theory means that the universe came into being from nothing, and obviously therefore proves Creation. For that reason, astronomers and physicists who espoused materialist philosophy have tried to come up with alternative accounts in order to be able, in their own eyes, to reject this reality. The "steady state" theory, one such instance, is a hopeless alternative produced by a number of scientists "philosophically" uneasy at the idea of the creation of the universe. Two other alternatives proposed by materialists consist of models that accept the Big Bang but seek to interpret it in ways that exclude creation. One is the "oscillating universe model," and the other is the "quantum model of universe." Let us now consider these theories in turn, and see why they are invalid. Put briefly, the "oscillating" universe model is a hopeless fantasy whose physical reality is impossible. The "quantum model of universe" is another attempt to purge the Big Bang of its creationist implications. Supporters of this model base it on the observations of quantum (subatomic) physics. In quantum physics, it is to be observed that subatomic particles appear and disappear spontaneously in a vacuum. Misinterpreting this observation as "matter can originate at quantum level, this is a property pertaining to matter," some physicists try to explain the origination of matter from non-existence during the creation of the universe as a "property pertaining to matter" and present it as a part of laws of nature. So in quantum physics, matter "does not exist when it was not before". What happens is that ambient energy suddenly becomes matter and just as suddenly disappears becoming energy again. In short, there is no condition of "spontaneous existence from nothingness" as is claimed. In physics, no less than in other branches of the sciences, there are materialist scientists who do not hesitate to disguise the truth by overlooking critical points and details in their attempt to support their own views and achieve their ends. 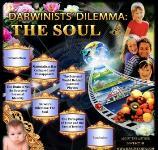 For them, it is much more important to defend materialism and atheism than to reveal scientific facts and realities. A recent and much-publicized version of the quantum model of universe was advanced by Stephen Hawking. In his book A Brief History of Time, Hawking states that the Big Bang doesn't necessarily mean existence from nothingness. Instead of "no time" before the Big Bang, Hawking proposed the concept of "imaginary time." According to Hawking, there was only a 10-43 second "imaginary" time interval before the Big Bang took place and "real" time was formed after that. Hawking's hope was just to ignore the reality of "timelessness" before the Big Bang by means of this "imaginary" time. As a concept, "imaginary time" is tantamount to zero or non-existence-like the imaginary number of people in a room or the imaginary number of cars on a road. Here Hawking is just playing with words. In addition, Davies also admits that the multiverse theory is purely speculative. 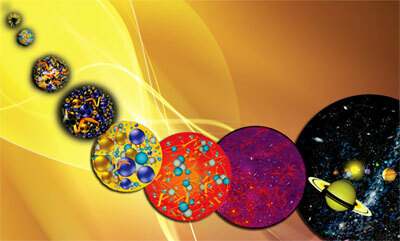 According to Davies, "It is but a small extra step to conjecture" the multiverse theory. However, he also admits that "credibility reaches a limit" and "As one slips down that slope, more and more must be accepted on faith." What all this shows is that alternative models to the Big Bang such as steady-state, the oscillating universe model, multiverse theory, and quantum universe models in fact spring from the philosophical prejudices of materialists. 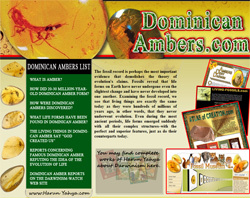 Scientific discoveries have demonstrated the reality of the Big Bang and can even explain "existence from nothingness." And this is a definitive piece of evidence of creation by Allah. 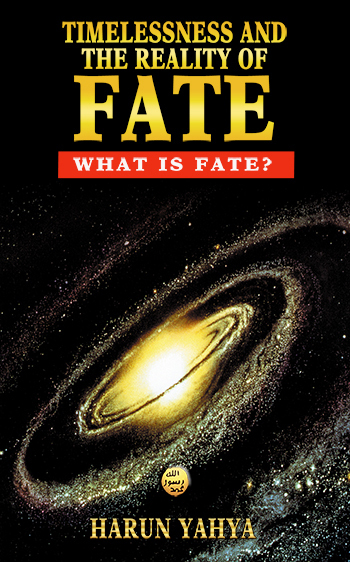 An example of the opposition to the Big Bang is to be found in an essay by John Maddox, the editor of Nature (a materialist magazine), that appeared in 1989. In "Down with the Big Bang", Maddox declares the Big Bang to be philosophically unacceptable because it helps theologists by providing them with strong support for their ideas. The author also predicted that the Big Bang would be disproved and that support for it would disappear within a decade.43 Maddox can only have been even more discomforted by the subsequent discoveries during the next twenty years that have provided further evidence of the existence of the Big Bang. Modern science proves the reality of the creation of the universe by Allah, contrary to what outdated materialists philosophy maintains. 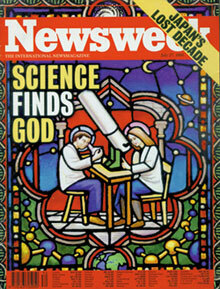 Newsweek made "Science Finds God" the cover story of its July 27th 1998 issue. In conclusion, the truth disclosed by science is this: Matter and time have been brought into being by our Creator, Possessor of immense power and unbound by neither time nor matter. 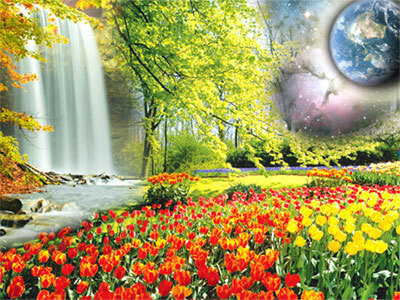 It is Omniscient and Almighty Allah Who created the universe in which we live. All these facts indicate that the claims of the materialist philosophy, which is simply a 19th century dogma, are invalidated by 20th century science. By erroneously deeming everything to consist of nothing but matter, materialism made the great mistake of denying the evident existence of a Creator Who brought matter into being and ordered it. By exposing the great intellect and order prevalent in the material sphere, modern science has proved the existence of an almighty Creator Who rules over the material sphere, that is, Allah. The order we encounter in the universe is also revealed in the world of living beings, causing the greatest support of materialism, Darwin's theory of evolution, to be literally demolished. Materialism could have held sway over a great number of people for centuries, having even disguised itself with the mask of "science" in the 19th century. Yet it seems that in the 21st century, it will be remembered as a superstitious belief opposing science. Humanity has rid itself of such superstitious beliefs as that the world stands on the horns of an ox, or that it is flat, and so will it rid itself of materialism. 11. Robert Jastrow, God and the Astronomers, Second Edition, July 2000, USA, pp. 105-106. 21. 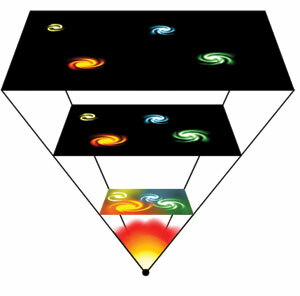 Charles Seife, “Illuminating the Dark Universe,” Science, 19 December 2003: 2038-2039.